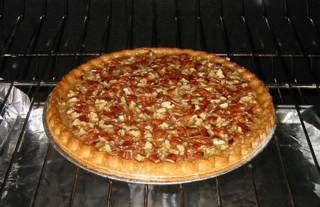 After baking the Chocolate Pecan Pie yesterday, I decided to bake a traditional pecan pie. Pecan pie fillings generally have a texture between custard and gooey. They are also very sweet. 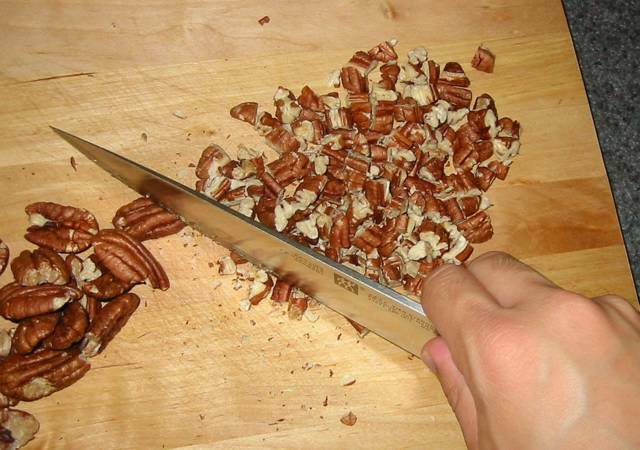 This is how I make a traditional pecan pie. I start by turning on my oven to preheat. I'll be baking the crust blind, so I preheat to 400°F. While the oven is warming up, I throw (170 g) pecans onto a pan and slip them in for ten minutes to toast, stirring once or twice. After the pecans are toasted, I set them aside to cool and then chop them up. If you chop them while they are hot, the pecans will crumble. It's best to wait the few minutes for them to cool off. Once the oven has been heated, blind bake the crust. This can be performed simply by lining the inside of the crust with a sheet of aluminum foil or parchment paper. Fill the foil or paper lining with pie weights (ceramic beads that keep the crust from rising and puffing up when baked empty). 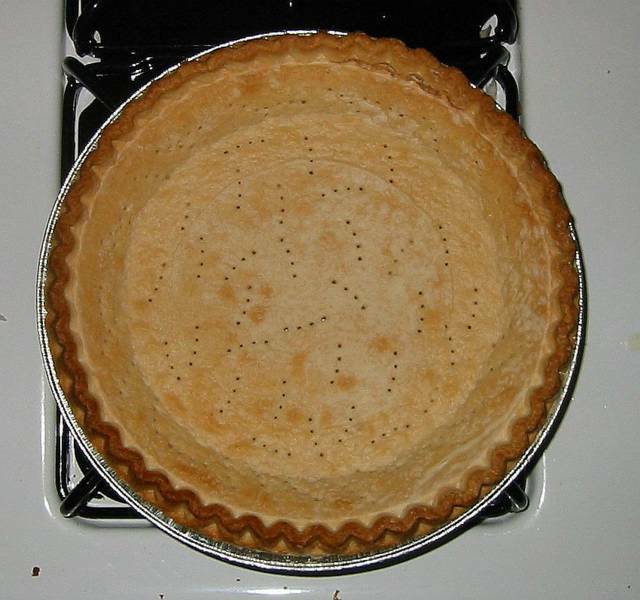 If you don't have pie weights handy, simply pop holes in the crust (bottom and sides) with a fork. (Make sure the crust is thawed if you're using a frozen crust.) Slip the pie crust onto the center rack and bake until the crust is light golden (about 10 minutes). In the meantime, assemble the filling. It is often faster for me to weigh out ingredients than to try to measure with liquid and dry measuring cups, so I'll list the ingredients in the units which I use in my own kitchen here and in both volume and mass below. The ingredients I use in the filling are 55 g butter, 3 large eggs (150 g total), 100 g granulated sugar, and (315 g) maple syrup. Purists will notice that I am deviating from tradition here. Normally you would use corn syrup, more sugar, and more butter. I like the flavor that maple syrup brings and I think that it's plenty sweet already. Melt the butter and whisk the ingredients together with 3 g of table salt to bring out the flavors. Now, fold in the chopped pecans. The filling is ready now. If everything was timed correctly, the crust should be light golden yellow to brown (ten minutes). Pull it out and reduce the oven temperature to 275°F. We're going to slow bake the pie to ensure the filling bakes evenly. A higher temperature might result in the center of the filling to still be liquid while the outside is overcooked. Pour the filling into the crust and level it. Slip it into the middle of the 275°F oven and bake for 60 minutes. The pie is done when you hold the sides and twist gently. The outer filling should not move and the inside should jiggle a little. Take it out and let it cool. This will allow the center to finish cooking and will let the pie set. Serve after fully cooled. I like to give it a bit of a refrigeration as well. If you want to serve the pie warm, after the pie has been fully cooled, put it in an oven at 250°F for 15 minutes. 9 in. pie crust prebake pour and level bake 275°F 60 min. Update on July 30, 2011: After baking three of these pies in rapid succession, I have a couple more tips. I used already chopped pecan pieces (available in the bulk section of my local supermarket) to save the (sometimes messy) step of chopping the pecans. If you're lucky enough to have chopped pecans available for sale, feel free to use those. The amount of time it takes to toast them seems to vary from day to day. Just spread them out in a pan and let them toast while the oven is preheating and check on them every few minutes until they are fragrant. Then check on them more often and remove them before they begin to burn. As long as you can smell the strong aroma of toasted pecans, it's good. I store my maple syrup in the fridge, so it's cold enough to immediately turn the butter back into a solid which makes it difficult to whisk. Microwaving the maple syrup after measuring out the quantity you need until it is warm (90-100°F) works well, just make sure it doesn't get too hot (150°F) or the eggs could cook/curdle. Finally, I followed the advice of an anonymous commenter below and instead of mixing the pecans in before pouring the filling into the fie crust, I simply put the toasted pecans in the pie crust and poured the filling over it. This was faster and easier because the pecan pieces didn't cause the filling to pour funny and I could easily make the filling come out in a steady controllable stream. Update on July 31, 2011: I discovered last night that my traditional pecan pie has the exact same ingredients and quantities as one of the subvariants of Pecan Pie published in The New Best Recipe by the editors Cook's Illustrated Magazine. Although, The New Best Recipe was published after my recipe was posted online, I suspect that whoever I got my recipe from years before ultimately got the recipe from an earlier printing of the Cook's Illustrated recipe. So, if you like this pecan pie recipe, be sure to check out the cookbook or the magazine! I like the main course and dessert recipes, how about some side dishes? Like veggies or something? What you've made so far looks absolutely wonderful and you are doing a great job! I'll work on more sides soon. I promise. Can you also do snacks as well as main courses? Have you tried using "Lyle's Golden Syrup" (a refiner's syrup) instead of maple? I has a very rich, carmel flavor which works very well in this pie. Great pie rec. and SUPER BLOG !!! I love the novel way in wich you organise the recipes that you talk about in your blog. It makes reading recipies so much easier and more pleasant! i've always had pecan pie with Karo syrup. i think i'd like to try one with maple syurp...that would be a different taste altogether. I would still test the recipe first (before you serve it for Thanksgiving). Oven temperature variations, viscosity of maple syrup, relative humidity, and other factors could still cause your pies to not set. Also, make sure your refrigerate your pies for a few hours at least before serving. I'll have to try this one out. One favorite in my family is cranberry-pecan pie. The tart cranberries cut down on the sweetness a bit making for a more complex flavor. I don't have the recipe here, but if I recall you just throw in a cup or so of raw cranberries (not crasins). Youm may remove some pecans, I forget. does any one know if you can freeze pecan pie? I absolutely hate pecans but have made pecan pie several times, it is my father's favorite and I am a totaly Daddy's girl. This is the second recipe I have seen that involves toasting the pecans, the other uses corn syrup like most of them do. Think I'll ask Daddy if he likes maple syrup and perhaps this will be a good way to bribe him into coming over for a visit (I just moved from chicago to Iowa and so am 5.5-6 hours away). I was also wondering if pecan pie can be frozen, I am pretty sure I have seen it in the freezer case at the store, I'll have to look next time I go. I think the mini pie idea would be great for me, I could make a bunch of minies and freeze them since I would never eat any and I'm not sure if he would eat it all in one visit (plus they'd be cute). My family, originally from the south, always made Pecan Pie with brown sugar...not syrup. I don't know if this was the original recipe or if the syrup method existed simultaneously. I do know southerners did not make, nor have ready access to, maple syrup...that's a New England food. Beat eggs until frothy and set aside. Combine sugar & water in a 2 quart saucepan. Using moderate heat, stir until sugar dissolves. Now bring to a full boil and cook for 3 minutes. 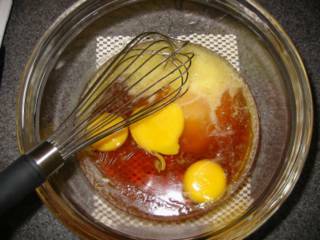 Gradually stir the hot syrup into the beaten eggs. 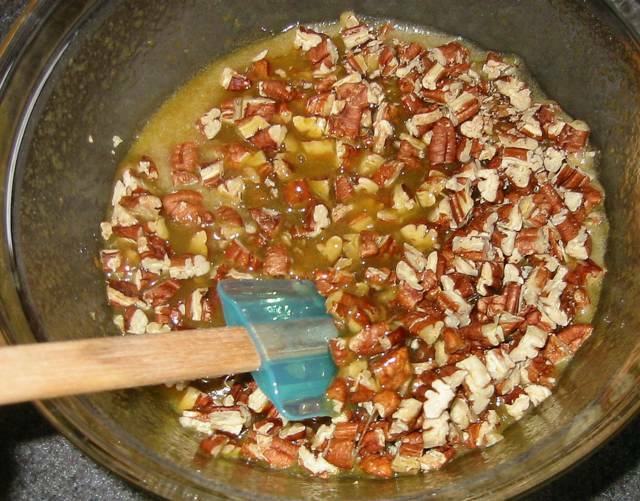 Blend butter, extract and pecans into the mixture. Pour into (unbaked) pie crust and bake @ 350 degrees for 1 hour or until set. You said "it takes a bit of muscle" to get the batter smooth, "because of the eggs." However, the problem is actually the order in which you are combining the ingredients, and how. 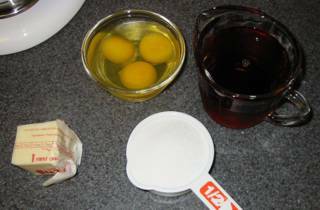 Start with just a single egg, beat it, and then add the rest of the eggs and sugar in increments. It will be quite smooth, then just fold in the dry ingredients. This is true of any number of recipes. Good luck! Good catch. I updated the article. does anyone know if you can freeze a pecan pie? Great-looking recipe. Try adding one or two tablespoons of dark or golden rum. It makes a huge difference to the dark-Karo-syrup version of pecan pie. Gives it a butter-rum flavor (I guess that's not too surprising). Yes, you can freeze pecan pie. Cook in the usual way and then allow to cool completely before freezing. It is a good idea to freeze it in the pan to protect the crust. When it is cold wrap the pie in plastic wrap and then place in a plastic freezer bag. The pie can be frozen for up to four months. To use allow to defrost in the refrigerator. If you want to eat the pie warm you can re-heat it in a low oven - 325�F for around 15-20 minutes. 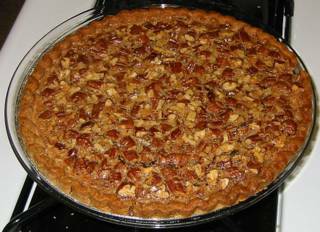 I'm looking for a pie that is similar to Mr. Edwards Pecan Pie. Most homemade pecan pie recipe fillings are too eggy. It is not smooth and creamy like I would like it. I've tasted a lot of homemade pecan pie and all of them no matter who bakes them, comes out with that eggy tasting slightly lumpy filling. Please tell me how the filling comes out! P.S. I can't stand it when people say ugly things on the board. If you don't like it say so. You don't have to use profanity. When I saw you substituted maple syrup for the Karo syrup, I needed to try this recipe. We got a gift of dark syrup and dh loves the light variety - so this is a great way to use some of it this Saturday. I'll let you know. A long time ago, we were traveling thru Georgia and had lunch. I ordered a piece of pecan pie and it was SO GOOD I never forgot it. The center of the pie was like a sponge, moist and cake-like (sort of), and not tooth-ache sweet - it was not sticky or gooey. Does anyone have any idea about that? Subject: Great recipe, great site. Thanks for the great recipe. A co-worker and I were talking about how to make a pecan pie without using Karo, and I'm thrilled that this one looks so easy and tasty! Maple syrup! What a great idea! love this recipe... and your site. Shirl above was looking for a pecan pie that was not gooey in the middle - that may have been a buttermilk pecan pie, which looks more like a egg custard in the middle and not syrupy. Can honey be substituted for the maple syrup. I have plenty of honey but not much maple syrup. I'd think it should work. I prefer to use a little less syrup [2/3 cup] and a little more sugar [1 cup] and I use dark brown sugar instead of white. I think that makes for a milder pie with an improved texture. I also throw my pecans into the crust while I pre-bake it, then simply pour the custard into the shell before closing the door and dropping the temp. Thanks so much for your very informative and easy to comprehend cooking site. This sounds amazing! I plan on trying both this and your chocolate pecan pie tomorrow. Do you have any advice or suggestions for baking mini pies? I bought small (single serving) aluminum pie dishes, but I am worried about possibly burning the crust while the middle doesn't cook at all (I had this problem when trying to make mini brownie bites). Do I need to lower the oven temperature or something? Please help! THanks- was looking for something corn-syrup free and LOVE the flavor of maple especially combined w/ pecans! Pie looks beautiful, haven't cut into it yet. I just wanted to say thank you so much for this recipe... I've been making it for Thanksgiving for the last few years and everyone loves it! It's become "my" recipe that I always bring along :) I've recommended your site to friends because I don't want to take all the credit for this lurrrrvely pie! I've just made it again to take to a friends place for Christmas.... can't wait! I have just used this recipe to make 150 mini pecan pies for a wedding. I followed the recipe almost exactly the only change I made was I used brown sugar instead of granulated sugar. These came out fantastic and everyone raved about them. They were delicious and people actually phone throughout the following week to tell me they were the best pecan pies they have ever eaten. Thanks so much for posting this recipe. It is one I will be making over & over. I noticed a guest post made mini pecan pies. I was wondering if the filling was stable enough where you could ship these pies to a friend without getting damage by movement. Okay, this is an engineering question! How do you cut pecan pie so it doesn't smash? I used whole/half pecans and I think the chopped ones would be much better. But even so, how do you cut through the pecans without them moving around and looking messy? secret trick: toast the pecan halves you intend to 'decorate' the top with before baking - that will make them softer and easier to slice thru. Lyle's Golden Syrup makes the best pecan pies, IMO. At worst, you will find it at Whole Foods and Kroger and Meijer both carry it here in the Midwest. >>The center of the pie was like a sponge, moist and cake-like (sort of), and not tooth-ache sweet - it was not sticky or gooey. Does anyone have any idea about that? the gooeyest pie is the sugar-egg 'only' mix. 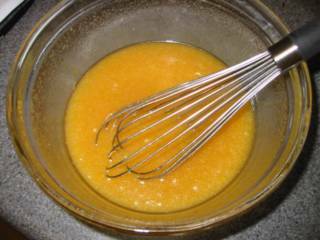 "mostly egg" produces the custard effect. the spongy filling relies on egg and flour beaten together with the sugar mix.